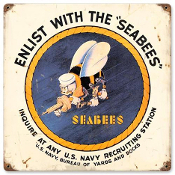 "Vintage" Seabee metal sign with a nostalgic look and feel! This Seabees metal sign measures 12 inches by 12 inches and weighs in at 1-pound. This metal sign is hand made in the USA using heavy 24 gauge American steel! It precisely reproduces a WW-II recruiting poster. The vintage "aging" effects are applied by hand and the corners are rounded with grommets.